Congratulations, you’ve retained a new public relations firm, and you’re getting ready to kick off a successful partnership. Like any new relationship, this one is in the honeymoon phase as everyone gets to know each other. But things are about to get real, so all parties need to be on their toes to ensure success from this point. In order to enable the most successful partnership there are some pitfalls to avoid. Fuzzy goals. Transitioning from the PR proposal to the working plan often includes a review of goals and objectives. While the initial goal for a company may have been to “support sales of x,” once the two teams strategize, additional goals may emerge. Maybe specific product attributes are key to driving sales, or perhaps there are new audiences, like stakeholders or funders, to consider. Agreement on realistic goals will help manage expectations and keep everyone’s eye on the ball. Also key is goal-setting with specificity. It’s better to go for “20% increase in website visits” backed by distinct strategies and tactics, than the more general “increase web traffic.” Most critical is securing mutual agreement on achievable PR goals against which the brand and team can create programming, and to put them in writing. Written agreement at every juncture of a PR engagement can head off any number of potential issues. At that time, it’s also incumbent upon the team to set KPIs for the planned initiatives and establish measurement tools. An unrealistic budget. 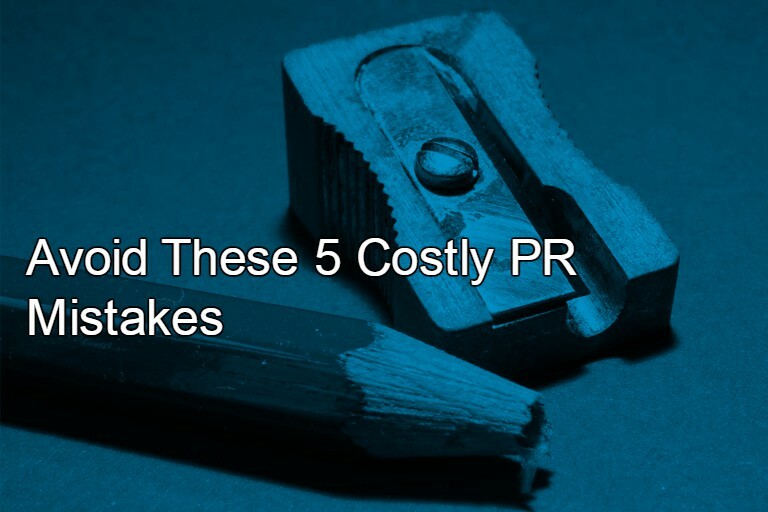 Start-ups and even more established companies often find themselves grappling with how to set a realistic PR budget. Some experts recommend using a formula based on a percentage of gross revenue. New companies might set aside 12 to 20 percent of gross or projected revenue for marketing, from which a portion would be allocated to public relations. For companies that have been in business more than five years, the allocation might be between 6 and 12 percent of revenue. While these formulas offer a good rule of thumb, in our experience a PR budget is often whatever a company can afford. Our best partnerships are sometimes a compromise between what we as agency professionals want to assure excellent outcomes, and what a company can comfortably allocate. Whatever the figure i,s however, we advise clients to understand all facets of a typical budget – the agency time, anticipated out-of-pocket charges, and the duration of the engagement. Funding a healthy PR budget that satisfies both sides is key to a successful partnership. Failure to staff properly. This caution applies equally to the PR agency team and the brand. On the agency side, we look to create a team with the right proportion of high-level strategists to direct account activities and other staffers to help implement initiatives. We may also include a dedicated writer if the account is heavy on thought leadership and content creation. On the brand side we look for one direct report for important decisions and troubleshooting rather than multiple “deciders,” which can cause confusion or even slow progress. As with other business partnerships, management by committee is rarely successful. Letting small problems blossom into big trouble. “Hiccups”can come in the form of program delays, conflicting workstyles, or unmet expectations about “small” things that aren’t actually small. Team leaders on the agency side should keep in mind that many people are reluctant to find fault with people, and that we all dislike confrontation. If a client complains about a team member being late for meetings, that can be handled quickly. But, if the lateness is a sign of lack of engagement, or, worse, the client feels that things aren’t clicking, it’s a huge red flag. Some of us have learned the hard way that when a client voices concern, immediate and tangible change must follow, even if that means a team member is replaced. To prevent a small problem that escalates into a relationship-threatening crisis, we urge our partners to share any concerns as early as possible. Of course, a formal account review process is designed to catch these kinds of issues, but if the review is yearly or even semi-annual, it may be too late. “Failure to communicate.” Most of the above advice can be summed up with this simple principle – “communication is key.” Almost any misstep can be avoided by communicating early and often. To keep those lines open, we offer many opportunities when we start a PR partnership, including scheduled interactions like weekly status calls and monthly meetings, as well as spontaneous check-ins. Ideally, we on the agency side will “over-communicate” so no one is ever in the dark about our work. And, though it may seem stilted in today’s casual, Slack-driven environment, recapping key decisions in writing with timely meeting reports and confirming emails is a good way to maintain a successful workflow and keep all parties on top of their commitments. Finally, a client of mine was fond of saying, “Unless its my birthday, don’t ever surprise me,” which brings up another universal truth about client-agency relationships. No one wants to be blindsided. Strive for honesty and transparency to manage expectations, build trust, and set a healthy communications routine, and you will lay the foundation for a lasting and lucrative relationship.